Purpose: Neurofibromatosis type 1 (NF1) is characterized by a highly variable clinical presentation, but almost all NF1-affected adults present with cutaneous and/or subcutaneous neurofibromas. Exceptions are individuals heterozygous for the NF1 in-frame deletion, c.2970_2972del (p.Met992del), associated with a mild phenotype without any externally visible tumors. 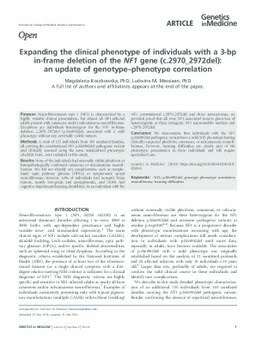 Methods: A total of 135 individuals from 103 unrelated families, all carrying the constitutional NF1 p.Met992del pathogenic variant and clinically assessed using the same standardized phenotypic checklist form, were included in this study. Results: None of the individuals had externally visible plexiform or histopathologically confirmed cutaneous or subcutaneous neurofibromas. We did not identify any complications, such as symptomatic optic pathway gliomas (OPGs) or symptomatic spinal neurofibromas; however, 4.8% of individuals had nonoptic brain tumors, mostly low-grade and asymptomatic, and 38.8% had cognitive impairment/learning disabilities. In an individual with the NF1 constitutional c.2970_2972del and three astrocytomas, we provided proof that all were NF1-associated tumors given loss of heterozygosity at three intragenic NF1 microsatellite markers and c.2970_2972del. Conclusion: We demonstrate that individuals with the NF1 p.Met992del pathogenic variant have a mild NF1 phenotype lacking clinically suspected plexiform, cutaneous, or subcutaneous neurofibromas. However, learning difficulties are clearly part of the phenotypic presentation in these individuals and will require specialized care.